School Sports SA – Sapsasa organises and conducts various competitions for primary school students throughout the school year. There are 3 levels of Sapsasa teams/sports: knockout (school based), district and state. Team sports are generally for Year 6/7 students and individual sports for students 10-13 years of age. Sapsasa information will be published on the school blog, daily student notices & the sports notice board. Schools can choose to nominate teams in school based knockout competitions in cricket, football, netball, soccer, hockey, tennis, softball and baseball. Parent support for coaching and transport is required for teams to be nominated. 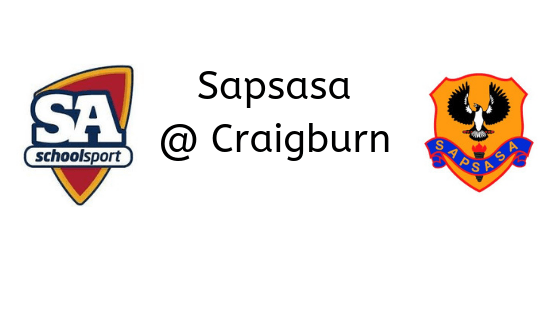 At Craigburn preference is given to Year 7 students playing the particular knockout team sport. Week long district carnivals are held throughout the year in softball, football, netball, soccer, hockey, cricket and tennis. Districts hold their own trials to select a district team. Craigburn’s district is Southern Heights with Year 6 & 7 students able to trial for teams. Students are notified of these trials throughout the year as information becomes available. State Championship Days and Carnivals are held throughout the year in triathlon, swimming, diving, lacrosse, beach volleyball, rugby league, orienteering, athletics, cross country, basketball, golf, lawn bowls, badminton, table tennis, touch football, ten pin bowling, orienteering, cycling and croquet. For swimming, diving, athletics and cross-country students must be in their 10th year or older. Our district Southern Heights holds district swimming, cross country and athletics days that our school participates in where district teams are selected.